Happy Monday everyone! I hope you had a great weekend. 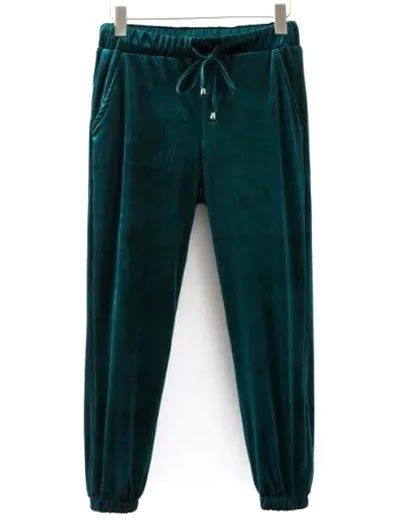 I wanted to quickly share with you these cozy emerald velvet jogger running pants. I wouldn't personally jog in them (haha), but they ARE perfect for running errands, or dressing up like I did in the picture above. I wore them out for a date night and was very comfortable. They kept me warm with the light breeze we had going on here in Vegas, and I also felt super dressed up pairing them with pumps. These joggers are currently on sale for under $20, and come in three colors (green, red & blue). The fit runs small, so make sure to go up one size. Haha I wouldnt jogg in a velvet pants either! But doing errants is ok! This pant would be perfect for a dinner at a buffet restaurant! You can eat as much as possible and still look great and feel great! Normally when I go eat a chinese buffet I always wear swear pants!😂 You really did well with the styling because I find it difficult to style anything with velvet. Nice color too! Haha, right? They are actually very comfortable. Thanks for stopping by. These joggers are everything! I'm obsessed with velvet almost to a fault. lol You styled these perfectly! I would have thought to dress them up with heels. Not only do I love the sweater you paired this outfit with, but I love the green jogger pants. I can already tell that they're warm and super comfortable to have on when running errands. Thanks so much. Appreciate you stopping by. I LOVE those joggers. Espeicially since they are emerald velvet. So chic and comfy! I don't usually like joggers but I like how you styled them. I also think the color helps. 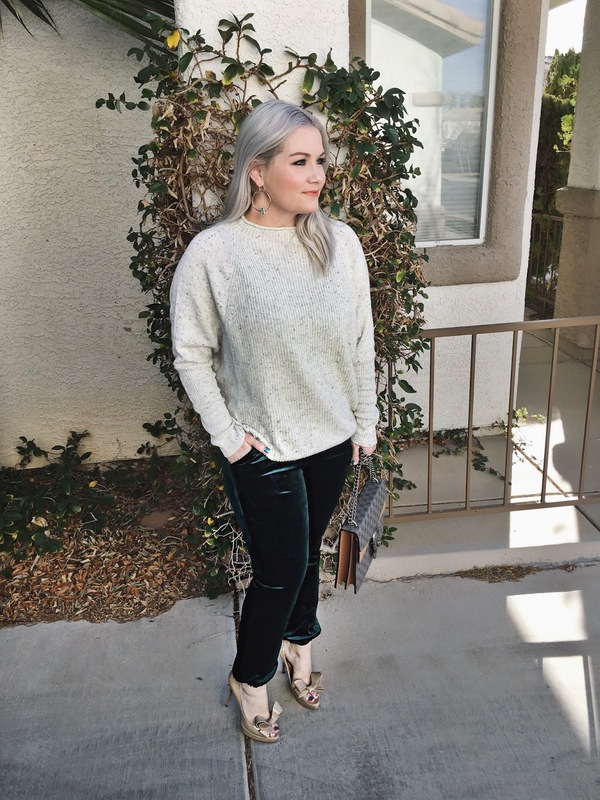 I actually think I have velvet overalls in my closet so I like the velvet look! Overalls? Love that idea. Thanks for stopping by. I bought these same ones and I'm obsessed with them. So comfy and totally different than what I normally wear! $20 what a steal! I love the jewel tone! Oh how I love the fancy chic joggers that are out now a days! I love these, so versatile and yes comfy but so stylish. Love the color and how you styled them! Yes, so versatile. And comfy! Oh my gosh, I love those joggers! What a gorgeous color and you paired it perfectly with that sweater and heels. LOVE! Me too. Joggers all day, everyday (i wish). I so wouldn't run in velvet either. I don't even think I own anything in velvet. But I do adore the color! Haha. Yes, the color is stunning. Thank you! Those are too cute, but I would not wear them to work out. You would never catch me running unless it was to save my life, lol!